In their early days, Matchbox made diecast replicas of sensible vehicles like farm plows, buses, and ambulances. Not the most exciting vehicles ever made, but the theme fit in well with their slow rolling wheels and axles. Back then, playing with toy cars involved pushing them around by hand. And with little competition in the 1:64 market, they sold like crazy. By the late ‘60s, however the game had changed considerably. Matchbox was still making slow rollers, but they were more frequently based on sportier, fun cars such as the Ferrari Berlinetta, or quirky mainstays like the VW Camper. Their cars started to include some nice features such as opening doors and hoods, as well as working suspension and even steering on some models. But more change was on the horizon. When Hot Wheels and Johnny Lightning debuted with their wheels built for speed, Matchbox took notice. Not only were these new brands meant to go fast, but they offered some seriously crazy fantasy designs as well as models based on concept cars. All of which left Matchbox scrambling to compete. But how? They responded in phases. By 1969, Matchbox was fighting back in the performance area. First, they created SuperFast wheels, which used free spinning, razor-edged wheels on thin axles for much faster travel. They even included sporty five spoke hubs for extra style. Several of the earlier models were updated to accommodate the new wheels, which helped sales tremendously (and resulted in more variants for collectors to chase). The updated models kept the same spot in the 1-75 count as well. In the Early 70s Matchbox cars debuted some wilder designs. Concept cars such as the Datsun 126 X were pretty far out, but at least rooted in some kind of reality. They also began to create their own fantasy designs… But not too fantastic, such as the Hot Rod Draguar and Gruesome Twosome. The Jag had a bubble canopy and a huge V-8 engine and wild side pipes, while the G.T. had two blown engines and a large magenta-tinted canopy. Both were wild, original designs, but it wasn’t a huge stretch to imagine these otherwise realistically proportioned models as plausible race cars. Then Matchbox went bonkers. Starting in 1972, some new cars got less realistically proportioned and went for sheer crazy. Cars with monster engines and giant rear slicks resembled Ed Roth illustrations come to life. Some of them even included disproportionately large drivers, such as the Flying Bug. The Tyre Fryer might be the pinnacle of these ridiculous designs, with very large block engine taking up almost half the car’s length. The cars also got funny names like the Woosh-N-Push. Even those sensible farm vehicles got this treatment in the form of the Mod Tractor with its giant Cobra engine. By the mid-70s, the Rola-matics series was carrying the banner for oddly fun cars. Each of these had some sort of moving feature, such as the rotating turbine on the Fandango. One drawback is that the peg on the wheel that triggered the moving part also slowed the cars down, making them less suitable for downhill racing. Perhaps realizing they had strayed just a bit too far from their original mission, Matchbox designers toned down the craziness a bit by the end of the decade, with most cars resembling the early sporty Superfast models in nature. When Mattel bought Matchbox, this philosophy became part of their official strategy, allowing their former competitors to do the more fantastic designs under the Hot Wheels banner. Love ‘em or hate ‘em (I have fond memories of some of these cars, myself), the early 1970s Matchbox deserve a spot in the time capsule you buried in your sandbox. What are your favorite Matchbox cars from this era? Comment below! 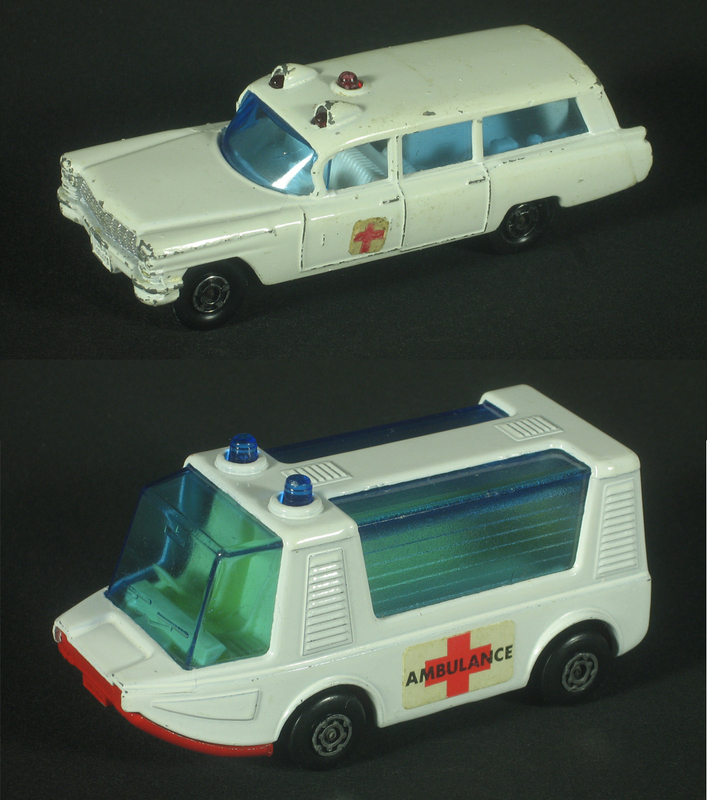 I still have two Matchbox ambulances from when I was a kid. My version of the Cadillac ambulance (the same one you show in your post) has the early (skinny) Superfast wheels. A few years later than that, Matchbox made the Stretcha Fetcha, which was unlike any ambulance I’ve ever seen on the real streets. When I was a kid, I liked the more realistic version better (although I appreciated that the Stretcha Fetcha had an opening back door so I could load and unload my patients). These days I’m really drawn to the wacky design of the later ambulance. But I have to say, I’m really glad I have both. Thanks for the extra info, Christian! The Polistil looks really close to the real car!